Chad White brings ceviche to the Inland Northwest at his new Zona Blanca inside the Steel Barrel. There might come a time when people look back at the experiment happening at the Steel Barrel and consider its arrival an important moment for the Spokane food scene. In the meantime, the combination of brewing incubator, taproom and ceviche restaurant is already offering things the Inland Northwest has never seen. The ceviche spot is called Zona Blanca, Chef Chad White's first opening since moving back to Spokane after 15 years away, time spent in the Navy traveling the world before becoming a restaurateur in San Diego (he still owns two spots in the area), and competing on season 13 of TV cooking competition Top Chef. "For me, it's just kind of the old story of 'All roads lead home,'" White says. "All my family lives here. And I wanted to come home and do something great here." What he found upon arrival was a food scene he thought lacked diversity, and no one doing the Latin American flavors he fell in love with traveling through Mexico. As he looked for spaces where he and his girlfriend/partner Niya Ivanova could set up shop, they were introduced to the guys behind the Steel Barrel, a long-gestating brewery incubator that was prepping its downtown Spokane space. Within just a couple of months, Zona Blanca was open inside the taproom in the Luminaria Building. White's variety of ceviches feature flavors from throughout Mexico, using traditional recipes and newly inspired ones. Even though Spokane is perhaps known as a "steak-and-potatoes" town, White is hopeful that area diners will discover the "extremely fresh, very bright, very clean flavors" in his food. "There are so many naysayers. 'That will never work in Spokane. We hope you're successful, but this is a big risk for you,'" White says. "Most of the people I tell, they assume that I'm going to be out of business. And then people come here and eat, and they're like, 'Dude, you're going to be fine.'" The combination of his ceviche and the breweries involved in the Steel Barrel, White says, "seems like a great marriage." In the creatively refurbished space, an old safe acts as a keg cooler and reclaimed steel and wood make the eating and drinking space an inviting one for diners and drinkers alike. With the incubator and taproom, aspiring brewers who want to try larger-scale production can join Little Spokane Brewing Company's Joe Potter and Young Buck Brewing Company's Cameron Johnson in the business that's been a long time coming; Johnson and Chris Batten, the building's owner, started mulling the idea nearly four years ago. They officially opened June 30 after a soft opening earlier in the month. "The concept has changed and evolved, but's it's always been focused around this incubator brewery, this idea of buying a brewhouse and sharing the expensive part, the brewhouse," Johnson says. "There are a lot of great brewers around here, a lot of amazing homebrewers. And if this can help them get the opportunity, that's great for craft brewing. That's great for Spokane." White has much the same attitude about Zona Blanca. 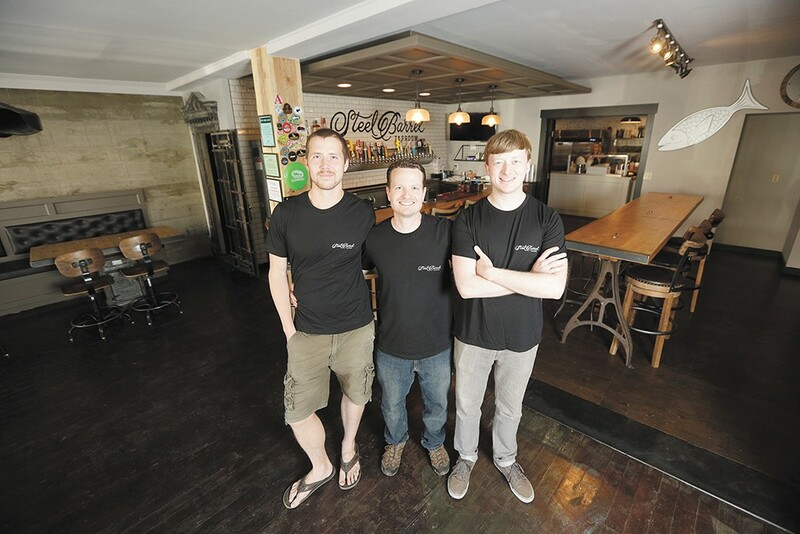 The Steel Barrel's Peter McArthur, Joe Potter and Cameron Johnson. "I hope that by opening this restaurant, other people will see it and think, 'Maybe I can open up something unique here' and not be afraid to do it," White says. Both Potter's traditional English-style brews and Johnson's more experimental beers are brewed on site, and they'll be joined by up to three more brewers in the future. All the in-house beers are available in the taproom, along with a variety of others that Potter, Johnson and taproom manager Peter McArthur agree on. Because of the long lead-up to opening, many Spokane beer zealots were waiting for the Steel Barrel. And while the taproom is a beer-lover's dream, offering $2 short pours that make it easy to try several styles in one sitting, the brewers want the place to be comfortable for non-beer-savvy visitors, too. "We have plenty of people who aren't craft-beer snobs coming in," Johnson says. "We don't want to narrow our market too much, even though we're beer nerds ourselves." McArthur is also mixing cocktails in the taproom. It's a dish with roots in the coastal regions of Latin America, with raw fish "cooked" in marinades of lime juice or lemon juice and a variety of spices. 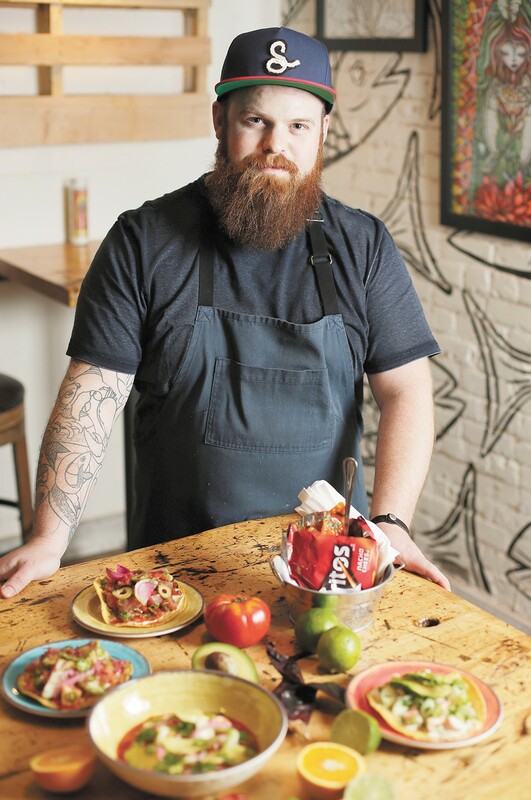 At Zona Blanca, Chef Chad White serves up several versions using recipes he's created himself or discovered on travels through different regions of Mexico. Some versions, like the Baja, incorporate Chinese flavors that came to be part of Mexicali cuisine when Chinese workers emigrated to Mexico for work. Others, like the Veracruz, feature Mediterranean flavors that arrived with the Spanish conquest of Mexico's Mayan culture. The ceviche is served either on a tostada for about $9, or in a larger bowl for about $20, depending on which style you order. "I think what we do really well is, for people who are coming in who have never had ceviche, or even heard of it, we do a really good job explaining what ceviche is," White says. "Even to the point where we're giving a historical background of why these ingredients even exist" in different versions of ceviche.